I recently took a trip down to the West of England to Roland’s HQ in Clevedon, to meet the team and understand more about the Roland view of the developing Industrial Print market. It is clear that Roland DG has dominated the wide-format digital inkjet print sector for more than 20 years; a brand globally recognised by print service providers. But, how is Roland technology being used in the industrial print sector? And what is unique about the Roland way? Visiting the Creative Centre at Roland DG’s UK office near Bristol gave me a fascinating insight into the huge array of applications and ways in which ‘industrial print’ customers are putting Roland DG technology to use. With customers ranging from Formula 1 teams to greeting card manufacturers (and pretty much everything in between), although perhaps less high profile, Roland has an established and proven track record in the industrial print sector. Roland technology is most commonly used at either ‘end’ of the manufacturing process; either for the creation of prototypes, mock-ups and proofs at the start of the product design process or as a customisation solution for functional or decorative print purposes, at the end of the manufacturing process. Roland offers an extensive portfolio of hardware, software and ink technologies and works with industrial print customers to deliver the best solution for their needs; this may mean an ‘off-the-shelf’ package or working with partners to deliver a more tailored solution. Of particular interest within the industrial print sphere is Roland’s VersaUV range of UV-LED printers and ECO-UV inks. 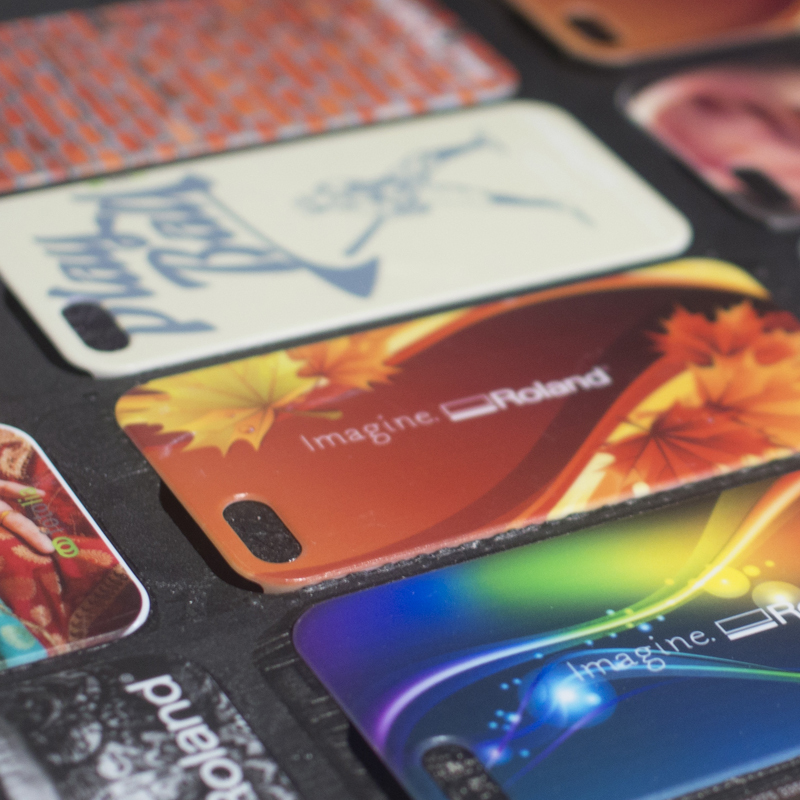 Ranging from desktop flatbed devices through to larger belt-driven and flatbed solutions, the VersaUV range enables direct print onto an incredible range of objects and substrates; from plastics, metals and glass, to leather, canvas and much more besides. The technology is being used across a wide range of industries for functional printing on control panels, dials and fascias as well as decorative applications, including the customisation of corporate goods, interior décor items, accessories, apparel and more. Packaging companies are also harnessing Roland’s VersaUV and eco-solvent print / print and cut technology in the production of mock-ups. Eco-solvent devices such as the TrueVIS printer / cutters have an impressively wide colour gamut for realistic colour proofs and VersaUV printers are used to emulate high-profile, deep embossing and hot foil embossing. ECO-UV ink can be used to either block out or enhance metallic cards and foils to create unique and impressive special effects and even Braille. Roland’s product portfolio also includes 3D technology – both 3D printing and subtractive milling- which complement the UV colour technology; particularly with packaging prototyping where physical models can be milled, or formed from milled moulds, and coloured graphics can then be direct printed. Roland’s mills are also widely used for creating moulds, physical prototype models and jigs for accurate larger-production printing. No huge production lines or noisy manufacturing environment. Instead, precision engineering quality is achieved by an assembler taking full ownership of the manufacturing process. In fact, the machines are described as individually handmade to exacting engineering standards with unerring care and attention. To find out more, visit the Roland DG booth (264) at InPrint 2017 and see in action Roland‘s advanced UV-LED printers, used by professionals worldwide for a host of industrial applications, including decorative and functional printing, packaging prototypes and more.